Twitter is a deep abyss of information that can overwhelm even the most social network-savvy individuals and swallow them whole. @ symbols are thrown around like rice at a wedding. Retweets and trending topics create the most irrational 140 character messages. And individuals follow others for a small number of reasons: possibly in an attempt to grow their own followers, they find the other person interesting and someone they may want to share information with, they’re trying to sell something, or they are just being genuinely creepy. With that being said, Twitter is an absolutely useful tool in the technology, advertising/marketing or business industries. Twitter allows for a strong and swift interaction between individuals in respective fields, industry verticals and the business universe as a whole. If you are in advertising and you want to keep up with all of the latest news, then all you have to do is follow a few reliable information sources such as Mashable’s Pete Cashmore, Ad Age, and AdWeek, among others. It’s like RSS, which stands for Really Simple Syndication, but better. Like RRSS. You can also follow individuals in your industry via 3rd party Twitter sites such as twellow.com, which allows you to search “Tweeters” by category. This will allow you to stay updated, and update, within the goings-on of the advertising, and any other, industry. This makes Twitter a very powerful tool when used correctly. 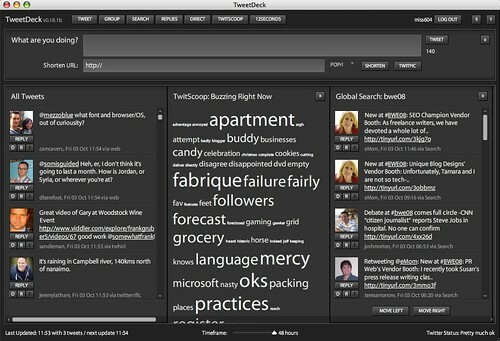 And to get the best use out of your Twitter account, I would strongly suggest leveraging TweetDeck. This is another tool among the many 3rd party Twitter additions, but it is really helpful in being able to see everything going on with your Twitter account. It allows you to see people talking about you, other’s tweets, direct messages, and other stuff, all across one large and efficient board. From the brands and celebrities perspective, Twitter gives a more personal feel between them and their consumers and fans by updating followers on what they’re doing, their likes and dislikes in the online community, and even holding contests and giveaways. Twitter has become a perfect arena to hold contests. Brands will have followers retweet a message to all of their followers so that they can win a prize. This blasts the brand’s message across the social webs while also getting fans involved with the brand or product. Recently Apple held a contest where followers just had to tweet the term “Moonfruit” to win a laptop. The idea was simple, easy to do, and got millions of users involved. From the point of view of the average citizen out in the world who is questioning whether or not they should get involved in Twitter, just ask yourself what would be your greatest reason to join. If it’s for social networking and catching up with friends, I strongly recommend Facebook over Twitter . . . as Twitter will be a passing fad for those individuals who are only there to update friends what they’ll be making for dinner. Facebook has social “fun” covered. But if your reason to join Twitter is for social and business, to network and get your name out there in digital, if you’re in the technology community and find many online articles absolutely fascinating . . . if any of these apply to you, Twitter is a great opportunity to grow your social networking portfolio. But remember that it should be part of a portfolio and cannot be the sole essence of your social media footprint.